Much like competitors in a beauty pageant, city-fringe projects being launched around the same time are vying for attention. All eyes are now on Gem Residences as it unveils its showflats and releases its unit prices on the weekend of May 20. The project previewed on Labour Day weekend (April 30 to May 2) with the opening of just the sales gallery. At least 1,036 people are said to have registered interest in the 578-unit development located on Toa Payoh Lorong 5 and Lorong 6. The developer is ramping up interest ahead of its VIP and public launch on May 27 and 28. 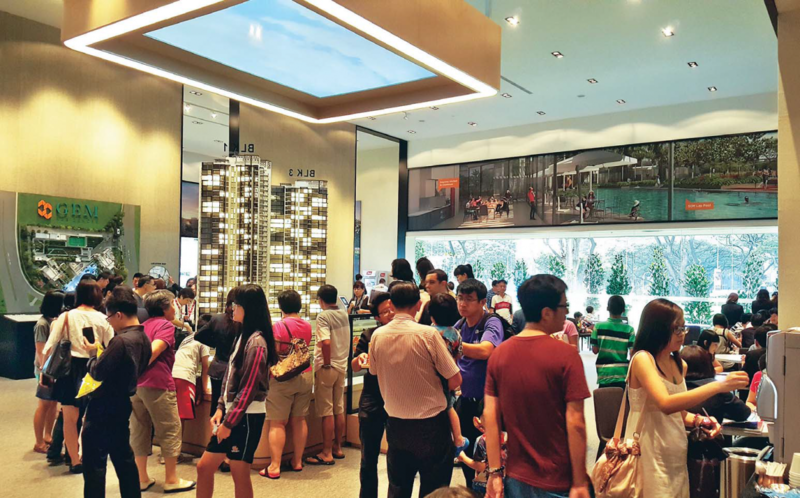 “We are trying to hit the magic number of 2,000 because there’s always a certain level of attrition at the actual sales,” says Vincent Ong, managing partner of Evia Real Estate. Gem Residences is a joint project by Malaysian developer Gamuda Land with a 50% stake and its two Singapore-based partners, Evia Real Estate (20% stake) and Maxdin (30%), a subsidiary of construction company Greatearth Holdings. Gem Residences marks Gamuda Land’s maiden foray into the Singapore property market. The property arm of Malaysia-listed engineering construction and investment firm Gamuda Bhd, Gamuda Land developed projects in Kuala Lumpur before venturing into Iskandar Malaysia eight years ago. Gamuda and its joint venture partner UEM Sunrise developed Horizon Hills, a 1,200- acre freehold township development with an 18-hole championship golf course. The project has been very popular with Singaporeans and expatriates over the years.